Go back to ' The Phreap Site ' index. Go to my music page' Put Your Bum To Work '. The Care Bears own a place in history because they were the first product that was planed around an animated film. Before, someone made a film like 'Micky Mouse' and then realized a demand for stuffed Micky Mouse dolls and other products. The Care Bears films started out as commercials for greeting cards and toys that had all been pre-planed. It was a successful venture until, sometime, maybe in the early 90's, the government regulated against these covert commercials. From a scene that I worked on with Glenn Wright, this picture was scanned from my rough drawing which was used in the making of the film. I spent considerable time digitizing and doctoring it but much care went in to preserve the pencil lines. Tenderheart Bear discovers that the children are in trouble in this scene. This is from one of the scenes where beams come out of the Bear's tummies. I'm a little surprised that it is so long ago that the Care Bears were in the mainstream and I have never thought of them as history before. I thought the Care Bears were famous around the world but after living in Japan for seven and a half years I have not seen a trace of them. Looking at some websites brought back a lot of memories. It seems that the corporate clout of 'Hello Kitty' has snuffed out the cuddly caring bears. When I read on a site that "Care Bears are not found new in any store. You can find them ... in thrift stores and at garage sales and flea markets. .... " * it changed my perception of them. 'Care Bears' are not commercial anymore! This July, I turned 50 and boasting about being an assistant animation on the first Care Bear film might do more to hinder my career then make it, so perhaps, I can better set my mind to writing a little about them in terms of Canadian animation history and my small part in it. The first Care Bears film was made in Ottawa, Ontario, Canada at Atkinson Film Arts. This animated TV show was called 'The Land Without Feelings' and I worked on it as an assistant animator. Throughout 1981 we, the people who hoped to work at Atkinson Film Arts, had been expecting 'the Kenner Toy' film (the Care Bears) and we had been looking at the proofs and working sketches and then suddenly, just as we were rapping up the third Raccoon film (in 1982, I think), I remember the business manager saying to a group of us to get ready to start taking some amphetamines because, we had two films to do on tight deadlines. The business manager was not a popular guy and may not have been clued into the fact that us animator, as far as I know, were not drug users. 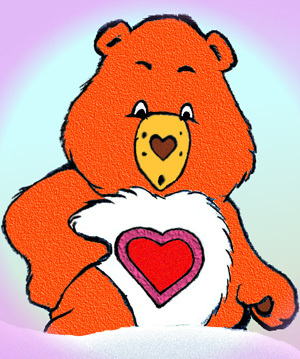 The Kenner Toy' film entitled "The Land Without Feelings" was the first Care Bears project. We kept the same crew as the Raccoon film and we were split into two crews. My animator Glen Wright had been assigned to Bell Telephone film so I worked on that film and did not start work on the Care Bears film until we had finished up that Bell film. After the animation was finish I joined the Xeroxing department and helped with their bulge of work but after that there was no more work and most of us were laid off. For me it had been long haul of six day weeks and long hours and very little pay as it was all piece work and I was a slow meticulous worker. An assistant animator does not get to do very creative work. The animator will do about five of the 12 drawings done for each second of animation and the assistant will do the rest. Many people do not appreciate the great artistic skill required to do this work and even animators can sometimes fail to notice how an assistant has improved there work. I only worked on the "The Land Without Feelings" for about the last month or so of it's production and did only a few scenes. Months later, when my Aunt Elsie (and her partner Jack) were driving me down to North Carolina to visit my parents (who were building a retirement home down there,) we got lost in the hills of West Virginia. We stayed in an out of the way hotel in the middle of nowhere and when we turned the TV on, the news was featuring the Care Bears and it was the scenes that I worked on (the ones with beams coming out of there tummies) that they showed. Even though I only worked on the Care Bear film for a short time, I think, it is the most famous (but not the best) animated film that I worked on. In a world where Hello Kitty rules I think there is room to remind people of some bears that really care. "The Land Without Feelings" kept a high standard of full animation that, I don't believe, was kept in later Care Bear films. Somehow the American Greeting Card Co. and Kenner were not pleased with Atkinson Film Arts and did not make any more Care Bear films with them. The next Care Bear films were made in Toronto by my old company, Nelvana. Perhaps it was that we did two films at once or perhaps Ottawa just did not have the number of animators that Toronto did. The scene above was one of my first scenes. Glenn Wright was mainly my animator for the film and this was his first film as an animator. This was a great scene with a nice background. It took me many long days and nights. These pictures are taken from a small QT movie, made from a video, so you can't see my pencil lines or very much of my contribution. I have access to the credits of "The Raccoons and the Night Star" the third Raccoons film and I think the same people animated "The Land Without Feelings" I have added comment about many of the people. Pino - I think was the director while Paul S. finished up the Raccoons. Sebastian Grunstra ("Don't call me 'Bash'") - Sebastian is listed as 'Animation Layout' on the Raccoons but I think he had a bigger roll on the Care Bear. Dan Craig - far as I know he stuck around Ottawa for a while. Dan was my animator for the next Atkinson Film Arts film, 'Hiawatha.' I could not keep up the pace and that was my last film at the Atkinson. Ian Freedman - he moved on to Vancouver where he helped set up Delaney & Friends Cartoon Production but he soon left the company and apparently became very successful working on his own. Ian sat beside me in my last year at Sheridan Collage. Kathy Harker - she married her assistant Scott Fiander (see below) and they stuck around Ottawa for a while. I think they knew each other from Sheridan Collage. Norm Roen - he was from Kelowna B. C.. We were in the same class at Sheridan Collage in Oakville, Ontario, for two years. Norm also went to Vancouver and worked for Delaney & Friends Cartoon Production, where I also worked. He is a talented painter and worked as a background artist. The last listing for him seems to be as a storyboard artist for 2 episodes of a TV Series called "Arthur" that were made in 1996. Chris Schouten - Chris went on to direct animation at Atkinson Film Arts. There are two prominent animators by the name of Bill Perkins. The other Bill Perkins worked on many Disney films such as 'Brother Bear', 'Rescuers Down Under', Aladdin' 'Beauty and the Beast 'The Little Mermaid'. Our Canadian animator and animation designer went on to work on 'The Care Bears Movie', 'Balto', and 'The Iron Giant'. Steve Rabatich - Steve, my mentor, was from California Arts. After "The Land Without Feelings" he moved to Vancouver where he helped set up Delaney & Friends Cartoon Production with Ian Freedman and Chris Delaney. I worked at Delaney & Friends with Steve again on "Value Tale Theater - The Wright Stuff" a 1/2 hour TV special in 1987 and "Nilus the Sandman" in 1990 & 1991. Steve remained Delaney's sole partner for those years until the early nineties when he was reported to have headed back to the States. The reports were true and he did work as an animator on 'Toy Story' in 1995. After that he was Running Back to Saskatoon were he set up Studio Saskatoon. He became Head of Animation at SCETCH College of Art & Design. Keith Van Allan - he was from Virginia and worked at Atkinson Film Arts for a number of years but got frustrated (could have been the low pay) and is said to have gone back to the States. Helen Wenzelbach - last I heard, after this film she quit animation and started studying geography to do map making. Glenn Wright - he was from Sarnia, Ontario, were I lived from 1956 to 62. I guess he stayed on at Atkinson Film Arts. Mik Casey - A real Irish man, Mik had a part in Directing the animation of the 'Curious George' films that Atkinson Film Arts had done a year or so before. Jim Cleland - As far as I know "The Land Without Feelings" was his last film. He had a hard time getting his life together afterwards. Pat Connolly - I always write my given name as 'P-a-t-r-i-c-k,'. How come I always end up with this? Chris Delaney - Chris joined Atkinson Film Arts for this production. He skyrocketed past me to become an animation. he reminded me to "... list me in the credits for Care Bears, which I worked on. I think I was an animator or assistant on that show. I animated the character Frostbite." Scott Fiander - He was from Gaspe? Quebec. Gloria Hsu - Gloria was always involved in Table Tennis and around this time won a bronze medal at the Commonwealth Games. She stayed with Atkinson Film Arts and became an animator. Mary Lynn Morris - Marylynn had worked up through the company becoming an assistant after a few years of working in the colour department. Dave Smith - Dave was moved up to animation for "The Land Without Feelings" He went on to work for Disney at a time when we Sheridan Collagers were having a hard time breaking into the Disney ranks. Wendy Van Essen - OK, sorry she did not leave animation after the film. "Wendy Van Essen ... continued in animation after the Care Bears "The Land Without Feelings" ... Wendo was an assistant on The Raccoons television series and worked her way up to animator on that series and on the "For Better For Worse" special made at Atkinson. Later on, Wendo worked for Don Bluth Animation in Ireland and then when the Bluth studio moved back to the U.S. (Phoenix, Arizona) she went with them. I'm not sure what she did after the Bluth group (which had become 20th Century Fox Animation in Phoenix, AZ) was closed down around 2001." All materials are copyright � Patrick Thomas Connolly 2003 (added to and updated September 30, 2006 and July 16, 2007 [re-posted]). P. S. - I have some production drawings in cold storage in Canada and they would make great material for a web site but I won't have access to them for years. Here in Japan I have some video and production drawings from other films but I have not put them up because I have not cleared their rights. This page has had hits since March 31, 2003. The Land Without Feelings - "The Care Bears rescue children who are kept as uncaring slaves in Professor Coldheart's Castle." The Raccoons and the Night Star" was the third Raccoons film and it was the first film that I worked on as an assistant animator. This was an hour TV special in two parts. The animation is of much better quality than that of the TV series that followed. The scene below was animated by Bill (Perkie) Perkins. This is the only scene that I assisted on for Bill. Bill is a great animator and on this scene he left the assistant (me) a lot of work. An assistant's work is often not apparent but on this scene I thought I had some input. The voice of this character (Melissa Raccoon) was that of the late country singer Dody West. Most people cannot see the good assisting on bad animation. Go to Early Music ' The Philip Rosseter and Robert Jones web site '. Learn about this Web Site. The music playing from this page in 'The Skater's Waltz (Les Patineurs)' preformed by the author; Trick T. Olly.